The tribe is extinct, but the bloodline probably still exists. I know my grandfather’s grandmother was a Spanish-Injun (Indians are from India, so I adopt the Injun), but I don’t know her specific tribe. 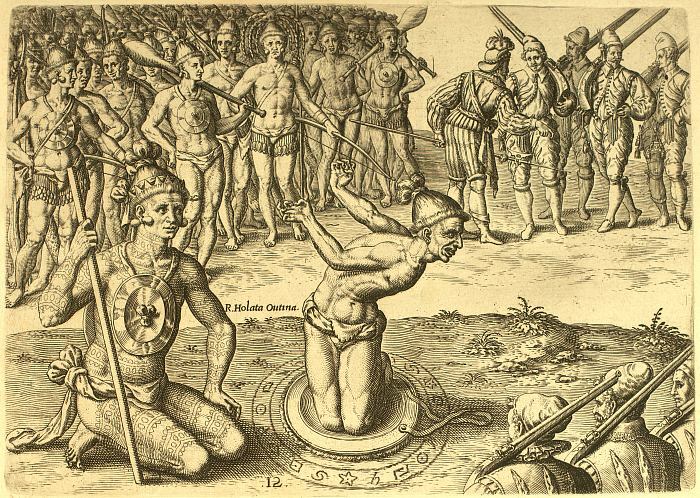 Two tribes, the Apalachee and the Timucuans had the closest affiliation with the Spanish..The Seminoles allied with the Americans or the British, depending on the time period, so the Seminoles helped wipe out my great-great grandmother’s tribe. Now, they steal-claim to my ancestor’s bones. We identify tribes by names that the Europeans gave them, not the native name for the tribe and that’s why the natives received the name Indians. My granddad wasn’t very close to his Native American side because his father preferred being the stereotypical half-breed drunk and the last supposed full-breed, my great-great-grandmother, (she could have been half, but my grandfather considered her full-breed), apparently wasn’t very nice. Granddaddy didn’t speak English very well and couldn’t write his own name, so too much about my Native American side was lost. When I said he didn’t speak English very well, I’m not saying he spoke a Native American language, but considering how intelligible he was, he may have had some mangled into his English. Obviously, the last of the Timucuans refers to James Fenimore Cooper’s novel, The Last of the Mohicans. All you would need to do is look at a name on an Alachua County census to know that my ancestor came from a Spanish Injun tribe. 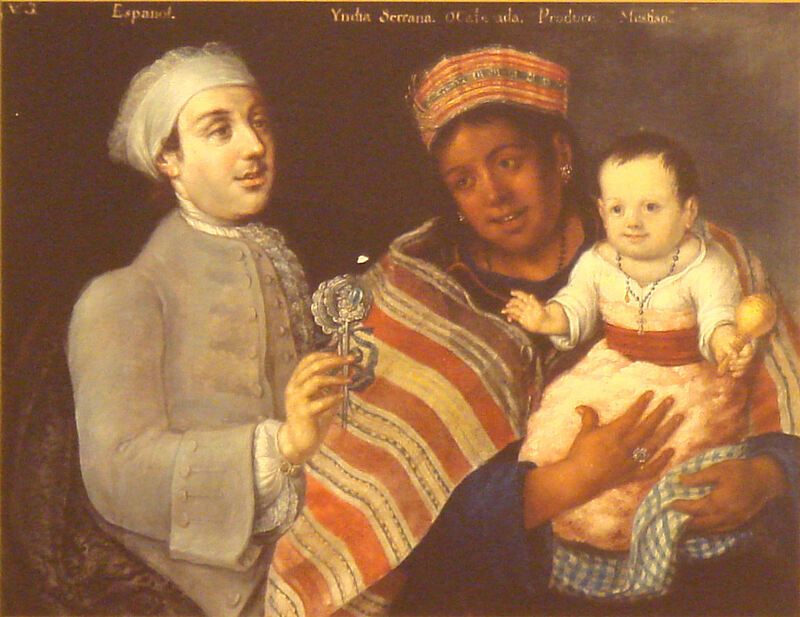 I use a portrait from the Wikipedia page for Mestizos because a Spanish-Injun is commonly referred to as mestizos. Notice the baby is White. Not every White person is just White. Howl like this wake’m the dead. Come Osceola and the renegades. I still need to work on the rhythm and will probably match the chorus to my Gator song, but workable for now. I alluded to ‘Peace Frog’ from, The Doors; ‘Peace Dog’ from, The Cult; and ‘Seminole Wind’ from John Anderson. I see where I might add a Flo Rida, ‘Wild Ones’ allusion but I will hold off for now. I may add a Creed allusion in the chorus after I finish my Miami song. When I get my three songs, I might see how I will match things up and whether I will add any other schools. Doak refers to the stadium. The FSU war chant is the ‘woah’ part. Oliver Stone offered Ian Astbury, the Jim Morrison role; which, went to Val Kilmer. 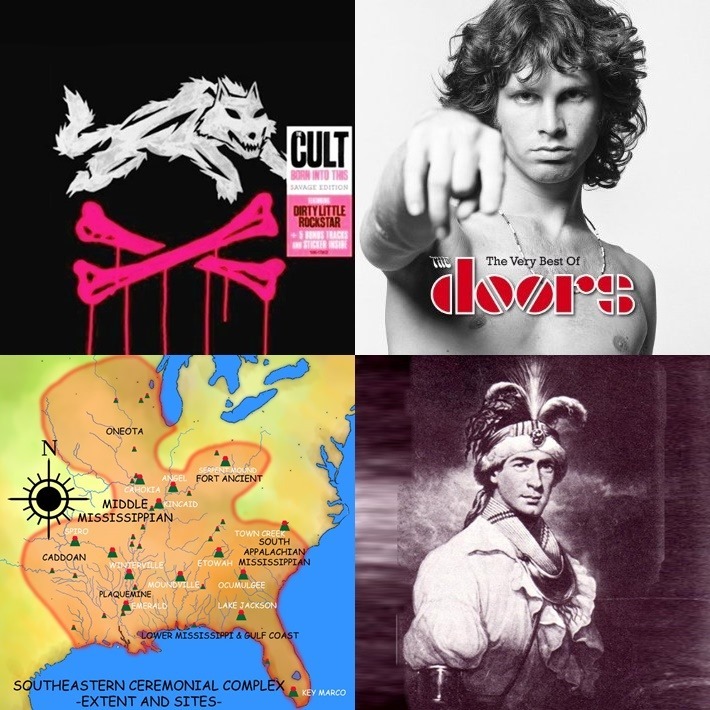 The Doors had a major influence on Astbury and the Southeastern Ceremonial Complex (or Southern Death Cult) donated the band’s name and influenced many songs. As you can see on the map, the Florida resides in the Southern Death Cult region. Astbury never attended FSU never attended FSU, but he should consider joining Jim Morrison on the alumni list or FSU should do me a favor and draft him. Who is the apparent Seminole chief, on the lower right? William Augustus Bowles, who had no Native American blood, but entitled himself as ‘Chief of the Embassy for Creek and Cherokee Nations.’ You don’t see the name Seminole because my ancestors did not name them, yet. I don’t know for sure if my ancestors gave them their name, but I have good odds. I have Spanish and Native American ancestors in Florida before English linked tribes. Bowles went to far when he called himself, ‘Chief of all Indians present’ at a tribal council. Those ‘Indians present’ turned him over to the Spanish and died in a Cuban prison. Political correctness is a tough thing to maneuver around. I find interest in many cultures, but all have flaws. I don’t know why my grandfather hated his grandmother; he never went into detail and may or may not have good reason. I love to link history to trivia and I’m not criticizing Morrison or Astbury for their interest in Native American culture but political correctness is tricky and I suspect it plays a part in the songs sung about Native Americans. I’m an allusion freak, so this limited song collection binds me, somewhat. Drafting, ‘The Cult’ gives me a few more titles to play with in my ‘Games Without Frontiers’ game that I do with sports fans in my novel. I enjoy sports, but fanatics are fanatics and many fail to see the sanity line. ; whether it be, religion, sports, or other social outlets. The Cult and The Doors have a Native American spirit which meshes well with the Seminole war chant; which, makes them allusion worthy for me. Astbury only has indirect connection to FSU, but sometimes I have to cheat. So I consider The Cult, as a definite maybe. Morrison is a for sure allusion. I still can’t remember offhand, if I mention Bowles (Estajoca was his tribal name) in my novel; this post also acts as a reminder.